I was fortunate enough to be able to tour the Edward Green factory in Northampton last week. A new building (as they’ve moved around a few times since leaving what is now the John Lobb factory in the centre of town) it nonetheless has a lot of atmosphere and personality. This is due in no small part to the personality of the staff, who delighted in teasing each other about which job best showed off their talents, or indeed which angle was best to photograph them from. One aspect that particularly caught my eye was the hand sewing of the apron on a Norwegian split-toe. This is the Sandhurst, a pattern revived from the 1930s archives that was the precursor to Edward Green’s famous Dover. It has been updated in two different styles to celebrate EG’s 120-year anniversary: a grain leather version in tan, with a round toe and external welt to give it a country feel (202 last), and a dark-brown calf version with a severely squared toe that would look well in the city (888 last). Two very different looks with the same model. The apron has to be sewn by hand because the two parts of the upper are at right angles to each other. A machine can stitch two parallel pieces of leather in any arrangement, but it can’t do angles. The sewing is done by pig’s bristle that is bound to the thread, which it draws through a small cut made by an awl. The bristle is narrower than a metal needle and can move through the leather at angles a needle cannot. The hand sewer prepares the pig’s bristle by cutting off its root, sanding the broken end to ensure it’s sharp and then splitting the other end to allow it to be bound with the thread. Several strands of yarn are then twisted together with the split bristle and rubbed down with beeswax. 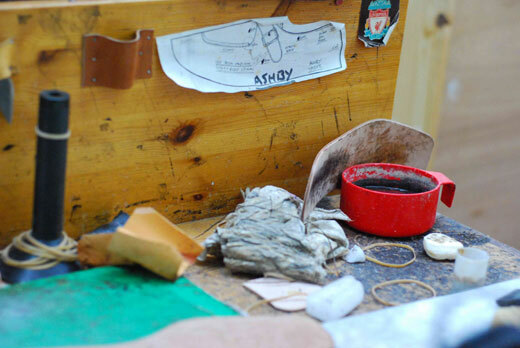 The thread is then rubbed hard with leather to melt the wax, ensuring that thread and bristle are bound together. 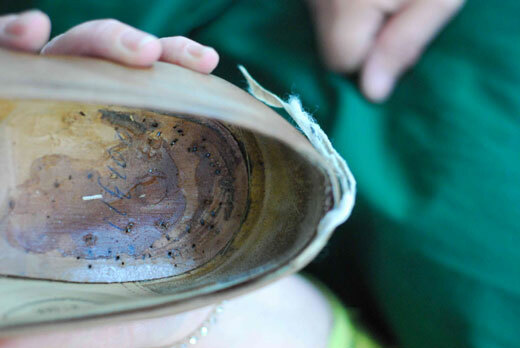 The beeswax also helps seal the stitching on the shoe. Doing the operation here is Gary Finedon, who joined Edward Green when it split from Lobb and has been hand sewing for 20 years. He makes around 20 such uppers a week, as does Green’s other hand sewer, Andrew Peach. It’s important to develop a rhythm and not stop halfway, as that usually ensures the stitches are evenly spaced. So of course I interrupted Gary with about four stitches to go. He tactfully finished the last few while listening to my questions, then put the apron down to give me his full attention. I never realised that the reason the split-toe seam has that distinctive finish is that this same hand sewing technique is used on the inside of the toe, to join the front two pieces of the upper. It’s that hand sewing underneath that creates the dimpled effect on top, which is so often highlighted by the polish. I was also fascinated by the refurbishment process at Edward Green. There seemed to be a lot of old shoes around waiting for this treatment, and the picture here shows the sock of one pair that had been worn away pretty badly inside. The two main reasons shoes are brought in is that the sock has worn away or the collar on the top of the heel has split. The latter is usually due to men not using shoe horns, stamping down on the collar and gradually destroying its structure. The thread that runs around the inside of the collar will often split as well. Edward Green replaces the sock and insole, resoles the shoe and repairs anything like the broken collar. Everything but the upper, which retains its personalised contours, looks just like new. Not bad for £180. My thanks to Euan, John, Hilary and everyone at Edward Green for making me feel so welcome. You can follow the discussion on Hand sewing at Edward Green by entering your email address in the box below. You will then receive an email every time a new comment is added. These will also contain a link to a page where you can stop the alerts, and remove all of your related data from the site. Just a quick words to tell you I really enjoy your articles and I consider your webpage as one of those very few that makes me reconsider my points of view about style, fashion and elegance. Todays article seems to me particularly interesting due to the fact I own quite a few EG and from my experience EG as well as Laszlo Vass are the best RTW shoes I have ever had. Love your writing. Such a pity that the images in your archived posts are no longer available. 1000km – the pictures here seem to be showing up fine for me. If any aren’t, please let me know and I will try to source the problem. I can’t imagine that those shoes are hand made. Good post.